Only 32mm of rain for April and the oats were glad of the downpour on the 27th having become rather slow in growth. Thursday saw Dorothy and I collecting another vintage piece for the collection and we now have a lister milk cooler. We did have some of the bits from Norcroft but this completes the item. The Holmes Chapel Fair organisers must be congratulating themselves this morning as although a cool breeze was blowing we had a dry afternoon with some sunshine and as I write now it is raining. They must have enjoyed our display as we are booked for 2010. 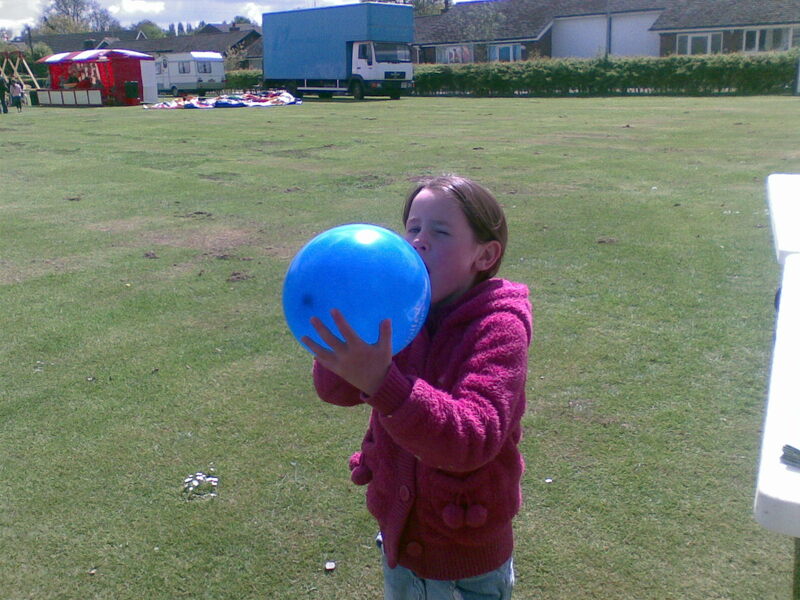 This young lady here proudly blowing up her balloon won by correctly guessing the feely box contents. Given this weeks wet forecast I think cleaning out the now empty looseboxes and spring cleaning the milking parlour will be this weeks priorities. 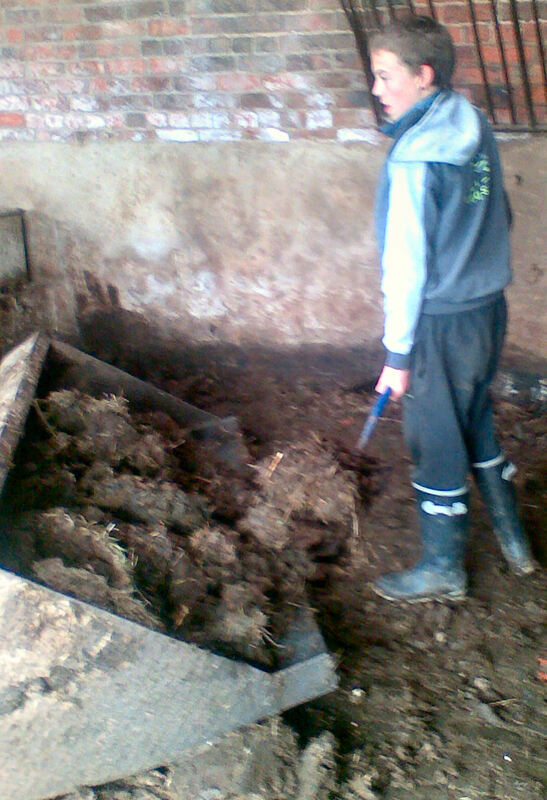 More works experience with Anthony from the Hartford High School and we spent part of our time cleaning out the poultry shed ready for the bigger chicks to occupy as we will be getting more soon and here they are in their new home and here is Anthony forking muck into the loader bucket. As I have three events over the coming up the last being the Wincle fete and trout run supporting the Macclesfield NFU branch see more here www.wincle.org.uk. Cows can be stupid at times and this gate was jumped by one trying to get back to it's calf after being let out with the main herd. I thought I was doing her a favour as there isn't much grass left on the orchard so I thought giving them a day out grazing with the herd would be a treat. Nearly 25mm of rain between the 15th and 17th and so things are beginning to grow better. Whitegate fete and apart from two showers late in the afternoon it stayed dry. Not so the next day! 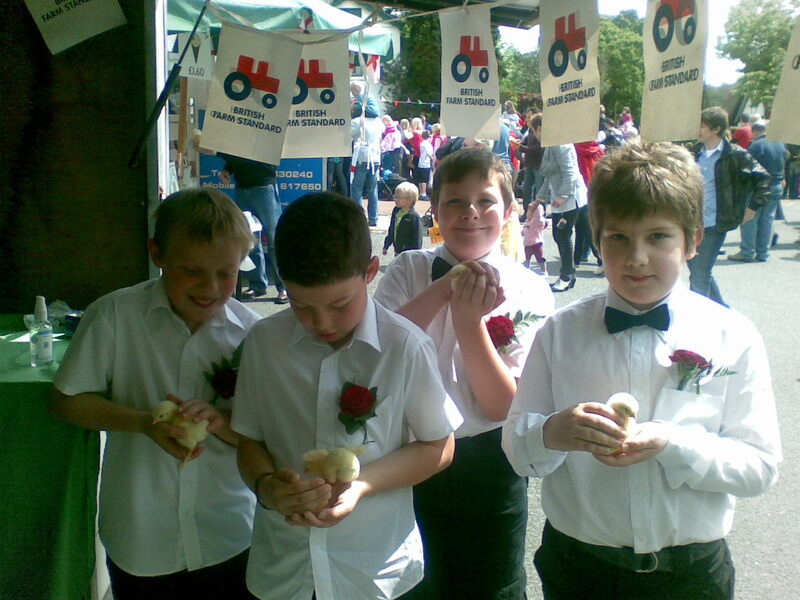 The Whitegate School junior Morris dancers had some fun with some of the chicks and Throughout the day I was being updated by Gemma a teacher from Brereton School who have borrowed our incubator together with some of our Duck eggs and it was hatching time. 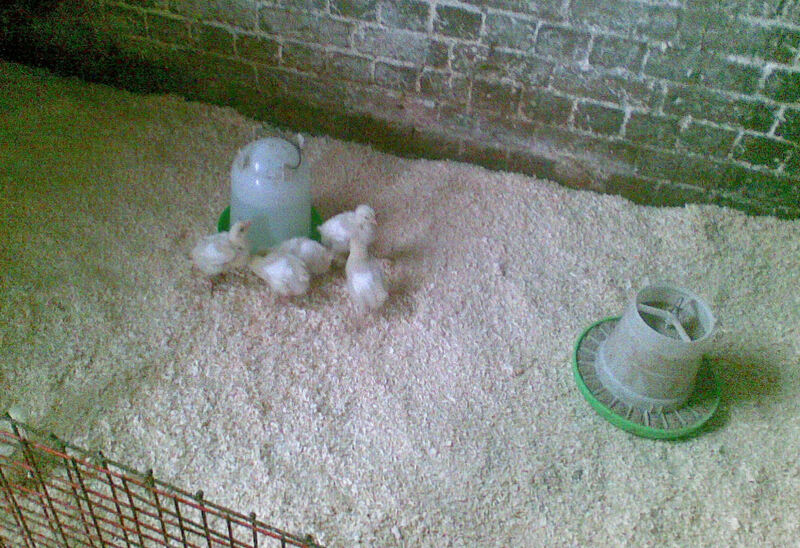 There are three of the very newly hatched ducklings and we still have one of the parents I'm really pleased to say given the trouble we had in January with the fox. 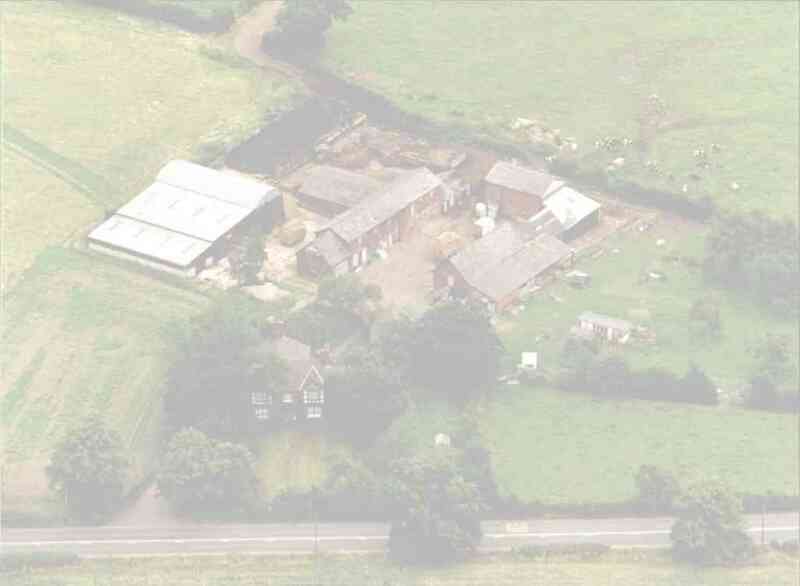 We are nearly up to date with the website and also our cleaning out of the buildings now most of the youngstock have been put outside. 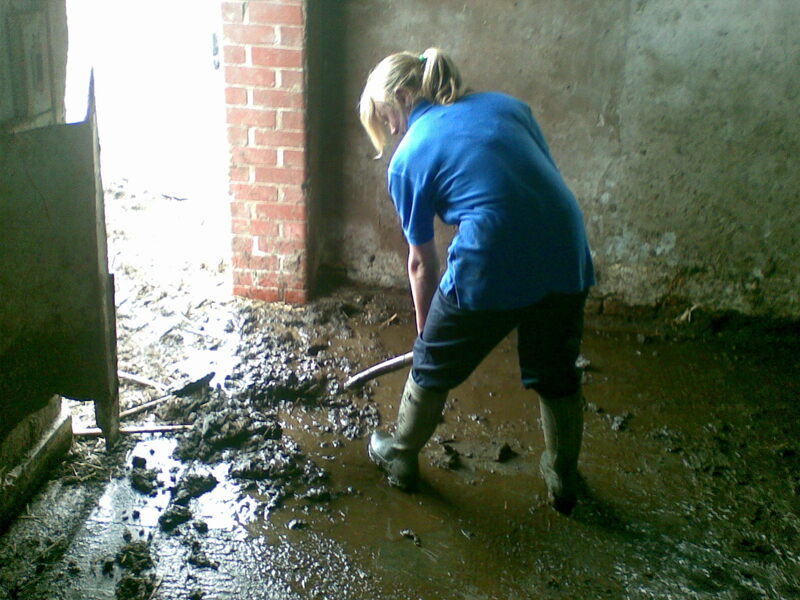 This week saw Katie from Reaseheath Collage on works experience and being an animal management student she soon got stuck in to the milking routine and also pictured doing the more mundane shovelling muck. We have had our final pre Cheshire Show meeting and all seems in order. The morning of the 24th and the sound of mowers was clear in the air as Andrew at Stanthorne Hall farm has started silaging. Chris next door (Bostock House Farm) mowed the day before and I'm sure Richard and Rosemary (Bank Farm) and ourselves won't be too far behind. Wincle trout run and fete was in glorious sunshine and 24c fine as a spectator like myself but well done to all who competed in that heat. Otherwise an excellent event and thanks to Keith for inviting me. I was however only able to attend as we are waiting for a hire tractor to arrive before we start our own silaging. Everything is ready and it will be all systems go once it arrives. We have mowed our first 5 acres of grass this being half of the drive field which is rather rough to drive on and therefore we have decided to big bale it rather than chop it. Besides being rough it also has a lot of docks which we aim to sort out this Autumn when it goes under the plough. Hopefully there will be a hire tractor available tomorrow and we can start chopping. 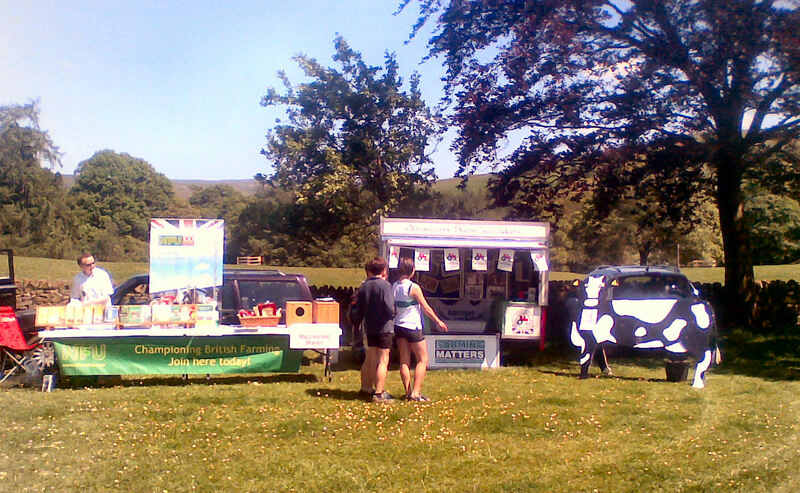 Sunday the 7th June is our 'Open Farm Sunday' open day!